The cheapest of the following five mansions goes for $7.495 million, and the prices go up—way up—from there. Many contain a few unusual amenities, while others are loaded with them. Many mansions have bowling alleys. It might even be true that more luxury mansions have bowling alleys than there are luxury mansion-dwellers who bowl. Still, other estates don’t have bowling alleys as modern and beautiful as this one. The mega-mansion pictured at top, built by Hamptons developer Joe Farrell on 11.5 acres, has a lot going on: a heated granite pool with an underwater stereo, and a master suite with 2,800 square feet. The lowest level of the three-level home is the Air Lounge, with a two-lane bowling alley, full bar and disco, rock climbing wall, and a full spa facility. The “recreation pavilion” also features a skateboarder’s halfpipe. 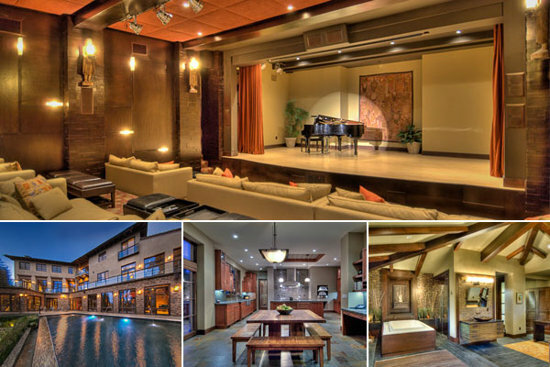 With all that, some of the home’s best known occupants are perfectly able to entertain themselves: Beyonce and Jay-Z are said to have paid $400,000 to rent the place last August. Home theaters with comfy seating and a movie screen or an oversize flat-screen TV are old hat. This estate in a gated community overlooking a country club features a full-on theater with a stage big enough for a grand piano. With Hollywood nearby, you never know when an entertainer might drop in. Whoever does come by can enjoy a full bar and lounge area for pre-concert gatherings, and separate guest quarters if the show runs late. This contemporary mansion just north of Chicago has a professional-grade indoor basketball court. There’s a good reason for that, indicated by the number emblazoned on the mansion’s front gates. It is the home of legendary Chicago Bulls ballplayer, Number 23 himself, Michael Jordan. Where can you do “over-the-top” better than in Vegas? 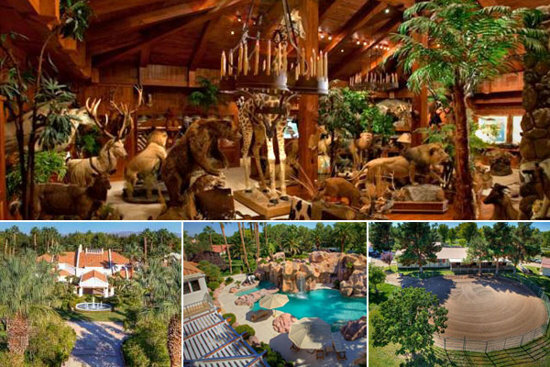 This 1991 equestrian compound has a casino with a bar plus an entirely different type of “game room” — a trophy room with light-activated animal sounds. Also on the premises are an indoor-outdoor dog villa, beauty parlor, shooting range, 20-car showroom with deionized-water carwash, and gas station. 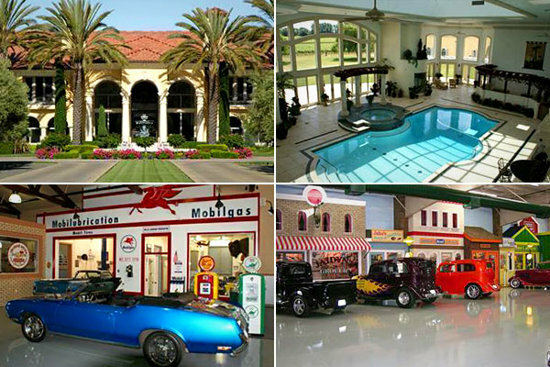 The owner of this mansion not only collects cars, he also has a collection of car-collector garages. Of the three auto barns (plus a maintenance bay), one barn is reminiscent of Elvis’ classic auto museum at Graceland. It comes complete with an antique Mobil gas station with vintage pumps, Main Street-style “storefronts,” and a functioning diner. There is also a vineyard on the grounds and a caretaker’s house that dates back to 1896. This entry was posted in Current Afairs, everyday life, Techmology and tagged aviation, beyonce and jay z, cars, filthy rich persons of the world, flat screen tv, Homes of the filthy rich, lane bowling alley, list of richest people of the world, most rich people in the world, Over-the-top home features of the 1%, percentage of the people who are extra rich, pictures of the top most rich people homes, pictures of top most rich peoples, top most richest persons, top rich people of the world, transportation.